The Wizard of Oz performance at the Waterfront Theatre was a real treat to behold. The costumes, stage design, lighting and special effects were extremely well done. 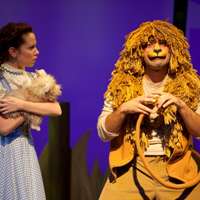 Dorothy and her dog Toto are swept away by a tornado into the Land of Oz. Dorothy meets a scarecrow that has no brain, a tin man that has no heart and a lion that has no courage. They decide to go on a quest to find the Wizard so that he can perform magic on them, and give the scarecrow a brain, the tin man a heart and the lion courage. So off they go along a yellow brick road to find the Wizard. When they meet the Wizard, he insists that they steal the broom that belongs to the Wicked Witch. They are to bring it back to him in exchange for his magic. The munchkins that they encounter along the road have colorful costumes, with shoes attached to their knees to make the normal sized actors appear munchkin size. This performance is one of the strongest ones in the play. Meghan Anderssen, as the Wicked Witch of the West, is the strongest performance and plays her role with absolute professionalism. Anderssen makes us believe that witches exist. The special effects given to the witch’s role, and Anderssen’s strong acting ability, produces a memorable, and successful character in this production. "Somehere Over the Rainbow" is a powerful song, original sung by Judy Garland. I find that the execution of this theme song in tonight’s performance was weak. It lacks dynamics and Dorothy’s voice does not have the power that is required to perform this classic song. The singing of "Somehere Over the Rainbow" is the most important piece of music in the play but it does not reach that status in tonight’s performance. Absolutely all the characters that Dorothy meets on her journey were very well acted. I loved the unique animated walk that Greg Armstrong-Morris as the Wizard of Oz masters and another quirk to his locomotion is his unusual head movements. Well done!